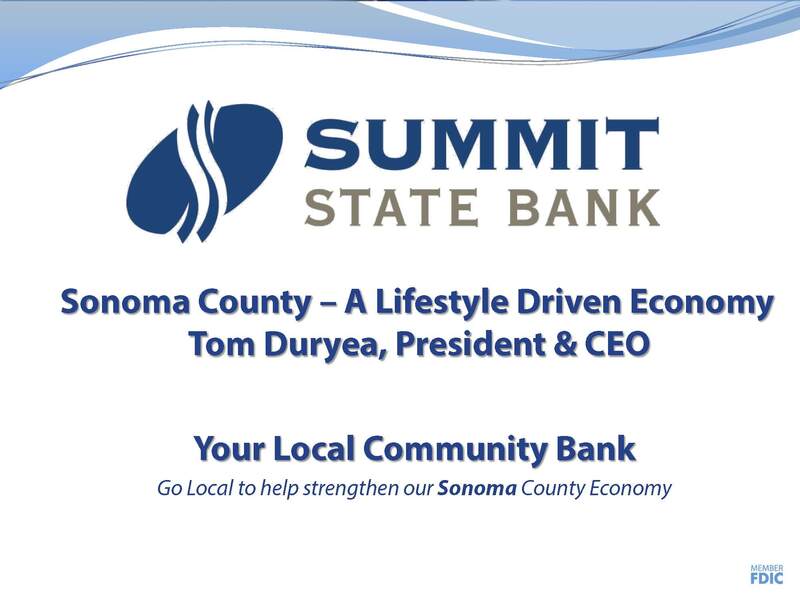 Tom Duryea, Chief Executive Officer of Summit State Bank gave a wonderful presentation on the role of community banking in Sonoma County, along with a detailed profile of the economic drivers of our county’s success. Mr. Duryea began his presentation by explaining the meaning of CEO - Confident, Enthusiastic, Optimistic. He sees all of these characteristics to the economy of Sonoma County. For the large part, the economy of Sonoma County is driven by lifestyle. This is a highly desirable place to visit and live and is showing a steady growth in those aspects of economic growth that are tied to tourism, wine industry, cycling and agriculture. People come to Sonoma County to enjoy "our slice of life". He presented an interesting bar graph showing the leading forces in our tourism economy with culinary services being highest on the list, followed closely by cycling, craft beer brewing, agric-tourism, hiking and a host of other activities. Tourism is growing by 6.2% per year. This is likely to continue. It is a role of Community Banks, such as Summit State Bank, to help finance the development of facilities to house and entertain these tourists. With the increased numbers of tourists, growth in the service and hospitality segments of employment is expanding rapidly and is now the second largest source of employment in Sonoma County, trailing healthcare and educational services. The wine industry is a major portion of the draw to Sonoma County. This is tied to a growing interest in wine consumption throughout the nation and the world especially in bottles selling for less than $25. Many of the tourists coming to the area enjoy the feeling of "closeness" to the actual production of wine that they can obtain by visiting the numerous vineyards and wineries throughout the county. Technology is a big factor in our economy, which is home to Medtronic, a manufacturer of medical equipment and KeySight , a company focusing on the smart phone market. Green technology is also evident in the county and Sonoma County boasts one of the highest rankings for solar installations and planned installations in the state. Cycling has become a major draw to the area. Sonoma County has been rated as one of "The 7 Greatest Rides on Earth". Bicycle touring is very big. At least one, and possibly more professional racing teams have chosen to train in Sonoma County with its varied terrain and year-round opportunities for cycling. Access to Sonoma County is increasing as the airport has recently extended its main runway and now has daily flights serving Seattle, San Diego, Portland and Los Angeles. With the coming of the SMART train, more people may be drawn to the area. There are several unique characteristics and accomplishments to Sonoma County's economy. In a national ranking of the strength of locally owned businesses Sonoma County ranks No. 1 in the country for areas of 250,000-500,000. We are No. 4 in the Pacific region and we are No. 14 out of 363 Metropolitan Statistical Areas! Sonoma County has the highest number of nonprofits per capita of all the counties in California as well as the highest rate of volunteerism. 80% of the people working in Sonoma County actually live in Sonoma County. This is compared to 35% of those in Marin County and 50% in Napa County. Community banks, such as Summit State Bank, are essential for the continued local growth of our economy. They are there to lend money to start businesses, to assist businesses in expansion, and to support other local aspects of the economy which keep the area vibrant and healthy. Thank you, Tom, for your insightful presentation.